The steering wheel height and distance from your body can be adjusted so that you can comfortably grip the steering wheel in an appropriate driving posture. 1. Pull the steering wheel adjustment lever up. - The steering wheel adjustment lever is under the steering column. 2. Move the steering wheel up or down, and in or out. - Make sure you can see the instrument panel gauges and indicators. 3. 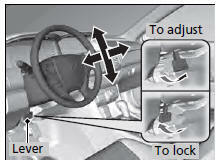 Push the steering wheel adjustment lever down to lock the steering wheel in position. - After adjusting the position, make sure you have securely locked the steering wheel in place by trying to move it up, down, in, and out. Adjusting the steering wheel position while driving may cause you to lose control of the vehicle and be seriously injured in a crash. Adjust the steering wheel only when the vehicle is stopped. Make any steering wheel adjustments before you start driving.